Is your family tree research more productive when you focus on one person? Or do you happily follow leads and create new branches all the time? 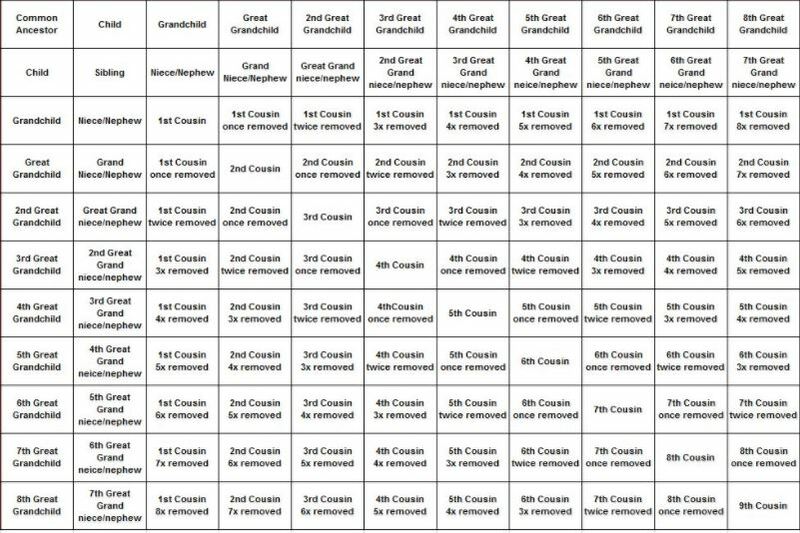 You can fortify your family tree by filling in the blanks for your closest relatives. Then you can move on to those tempting new branches. If you have a few moments to yourself this holiday season, think about your specific genealogy research goals for the new year. Working your way down your list of specific goals will make your tree stronger, faster. Here are some suggestions for creating your genealogy goals for 2018. My grandparent chart shows me exactly who's missing. Create a chart or spreadsheet of your direct-line ancestors to see which sets of great grandparents are missing. 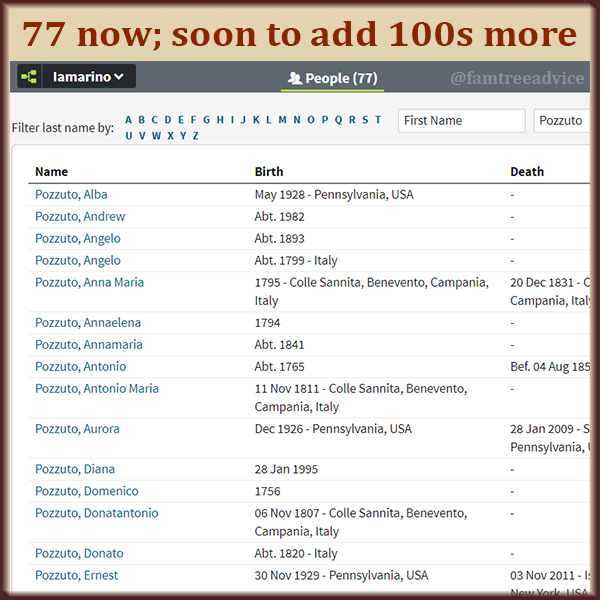 See How to Visualize Your Ancestor-Finding Progress for a spreadsheet you can use. My grandparent chart showed me that I needed the most work on my mother's mother's family. When I saw how much further I'd gotten with every other branch of my tree, I decided to focus on Grandma's line. I made great strides! See Today I Demolished My Family Tree's Only Brick Wall. Your chart can show you where your tree needs the most work. Your goal might be "Find my 4th great grandparents in my paternal grandfather's line." My document tracker shows me which documents I have and don't have. A few years into my genealogy research, I had a big collection of downloaded documents: census forms, ship manifests, draft registrations cards, and more. My filing system is very logical, so I can find what I need in a heartbeat. But with such a big collection, it was hard to know if I was busy searching for something I had already. See Haven't I Seen You Before? My document tracker spreadsheet gives me a quick way to see what I have for a person and what I'm missing. 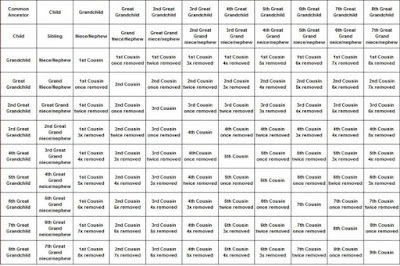 Another of your goals for 2018 could be to "Find every missing 1940 census for the people in my tree." I wish every document I needed for my family tree were online. But sometimes you've got to request a marriage certificate from the state, or buy a copy of a death certificate from the Department of Health. 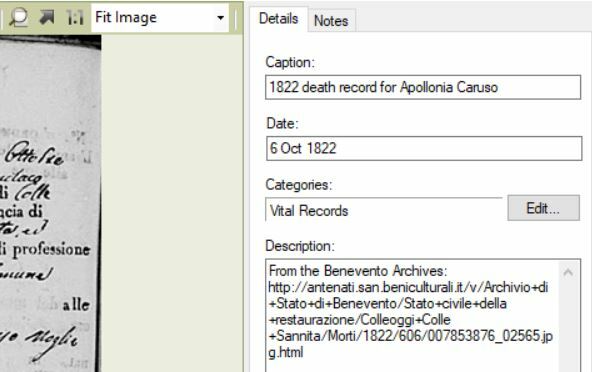 If some of your ancestors died not so long ago, it's unlikely you'll find their death records online. 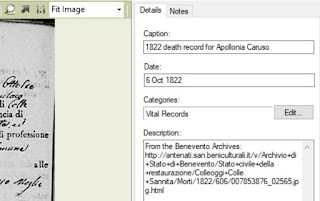 You've got to find out how to order a copy from the state where your ancestor died. I wanted a copy of my grandfather's 1992 death certificate to learn his exact cause of death. My brother, my cousins, and I knew it was two types of cancer, but we weren't sure which types. As his direct descendants, we thought we should know. Since my grandfather died in New York City, I had to request a copy in a certain way. If he'd died somewhere else in New York state, or in another state, I would have had to follow a different procedure. P.S. They did not send me his full death certificate, so I still don't know his official cause of death. Your goal for 2018 might be "Get copies of birth, marriage and death records for my grandparents and great grandparents." I have two pieces of family lore that are so vague, I may never be able to confirm or debunk them. One story says that my great grandfather's brother, Agostino, left the Bronx and moved to Chicago because he was involved in a fight that left a man dead. I can try to pinpoint when he left the Bronx, and then search newspapers for a story about a man dying in a big brawl. Another story says that my great grandfather Pasquale left New York and moved to Ohio because of an injury. He and his brothers-in-law worked for the railroad. One of the men let his son into a restricted area. The boy did something stupid and lost a few toes in an accident. To avoid getting fired, they packed up and moved. The men continued working for the railroads. I suspect the railroad in Youngtown, Ohio, needed workers. They may have gotten an incentive to go work there. But if the story were true, there might be some documentation of the boy with the missing toes. Newspaper research could be what you need to confirm or debunk your family stories. Your goal might be "Find proof for my cousin's claim about our ancestor." Aim for five or six goals that will provide the most bang for your research buck. If you achieve these goals, imagine how much family tree research you will accomplish in 2018! Download your DNA to use elsewhere. 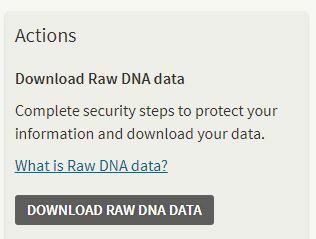 When you order your DNA test, you should have the option to download your raw DNA file from the company's website. 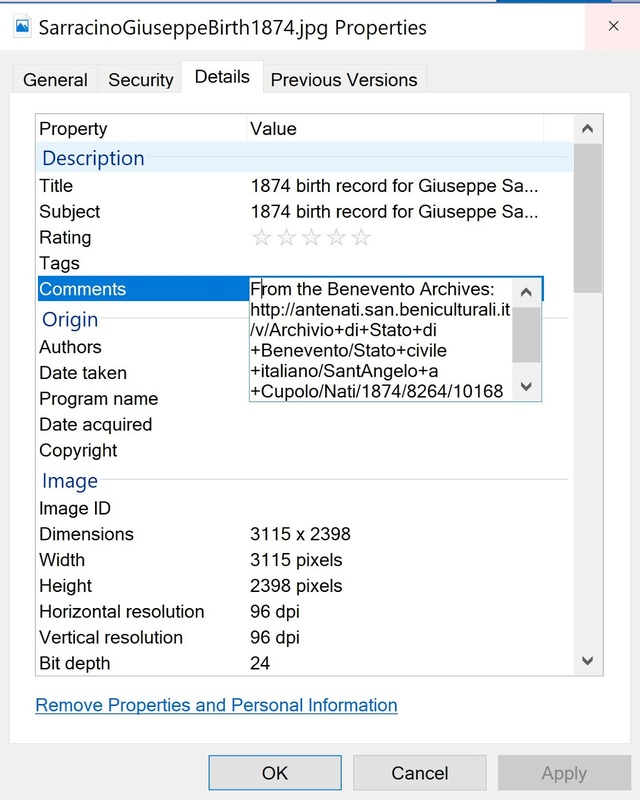 You can submit that raw DNA file to other websites for a different analysis. For example, after attending a genealogy seminar featuring Judy Russell, the Legal Genealogist, I paid a small fee to submit my raw DNA to FamilyTreeDNA.com. She suggested that if you submit your DNA to multiple sites, you're more likely to find relatives. My FamilyTreeDNA analysis was similar to what AncestryDNA told me. The percentages were different, but it wasn't far off. I like AncestryDNA better because it pinpoints my origins as "Southern Italian" and not just "Southeast Europe". This section tells me my parents are related! I looked for more sites to analyze my DNA and found that I could create a free account on Gedmatch.com. Look for "Raw DNA file Uploads" in the "File Uploads" section of the page. 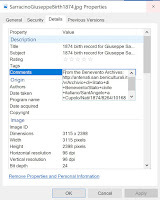 Follow the steps to submit the ZIP file of your raw DNA to Gedmatch. You'll get a "kit number" once your DNA is analyzed. Keep that number handy. Now you're ready to try out a handful of tests. Look in the "DNA raw data" column of the "Analyze Your Data" section of the main page. Today let's focus on "Are your parents related?" Click that test name and enter your kit number. On the results page, you'll see each of your chromosomes. Color-coding shows how many segments they have in common. Scroll down to the bottom of the page for a conclusion. My test says, "This analysis indicates that your parents are probably distantly related." Up at the top of the page, my Chromosome 2 shows my largest DNA match, measuring 7.6 Centimorgans. I decided to run a quick test to help verify these results. I know that my father's parents were third cousins. So his raw DNA should also show that his parents were related, but my mom's DNA should not show a relationship between her parents. Gedmatch passed my test. It did show that my dad's parents were related, but my mom's were not. My dad's DNA has two chromosomes with a significant match. The results also showed that his parents were more closely related than my parents. My test gives me good confidence in this parent-relationship test overall. in your mom's DNA match list. 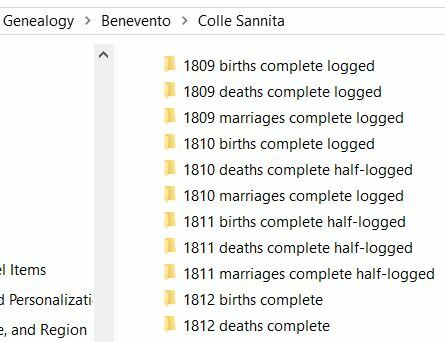 Once I learned my mom and dad are related, I went back to AncestryDNA to see if dad shows up in mom's DNA match list, and mom shows up in dad's. My mom's DNA match list has my dad as her 4th cousin. More specifically, the results point to high confidence that they are 4th–6th cousins. A standard cousin chart tells me that if they're 4th–6th cousins, they share a set of 3rd–5th grandparents. Cousin Chart, showing how two people are related. My own ancestor chart (see How to Visualize Your Ancestor-Finding Progress) shows me how many of my parents' 3rd–5th grandparents (my 4th–6th grandparents) I've identified. So far, I have not found my parents' common ancestors. My ancestors all came from a few neighboring towns in rural Italy. I visited those towns. My one grandfather's town is so close to my other grandfather's town that I could see one town from the other. I think at some point, a man from one of their towns married a woman from the other. Thanks to this free, secondary analysis of my DNA, I have a purpose. I must find out exactly how my parents are related! What secrets are locked in your DNA? So you think you know the main ancestral last names in your family tree, right? You may be way off! There is a way you can visualize which family names are making up the majority of your family tree. 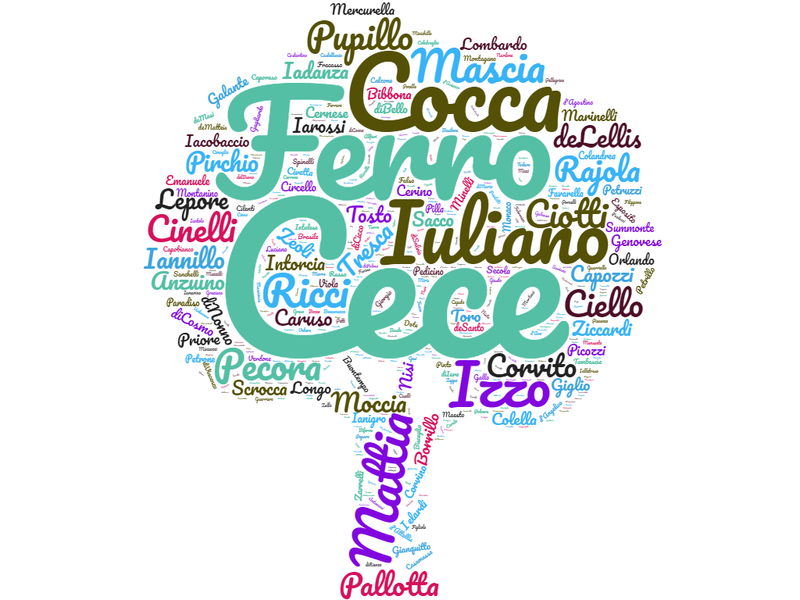 Recently I've seen a word cloud floating around that shows the most common last names in each of the regions of Italy. 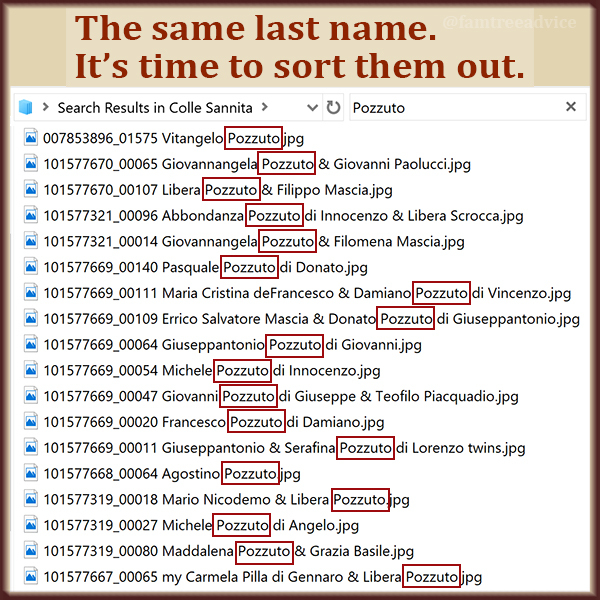 It's plain to see that Russo and Rossi are the most common Italian names throughout the country. What about your family tree? A word cloud shows the frequency of names in your family tree. I created this tree-shaped word cloud using only names from my grandfather's hometown of Baselice, Italy. My Baselice Family Tree Maker file has more than 16,000 people, and this required a lot of manual editing. To save a few days, I'm showing only the last names of people whose first name begins with A. That's 3,355 people! Ironically, the biggest names I see are not closely related to me. 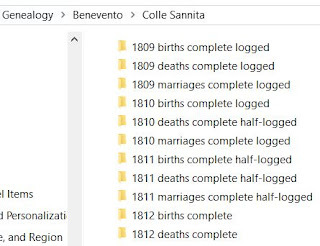 You should know that because of intermarrying, I am related to roughly 13,000 of the 16,000 people in my file. Even more surprising is that I can spot the names of in-laws, like Pallotta at the base of the tree and Borrillo at the base of the leaves. Oh! And there's a tiny Pilla in the center. That's a name from my other grandfather's family! Click the "Word list" button. 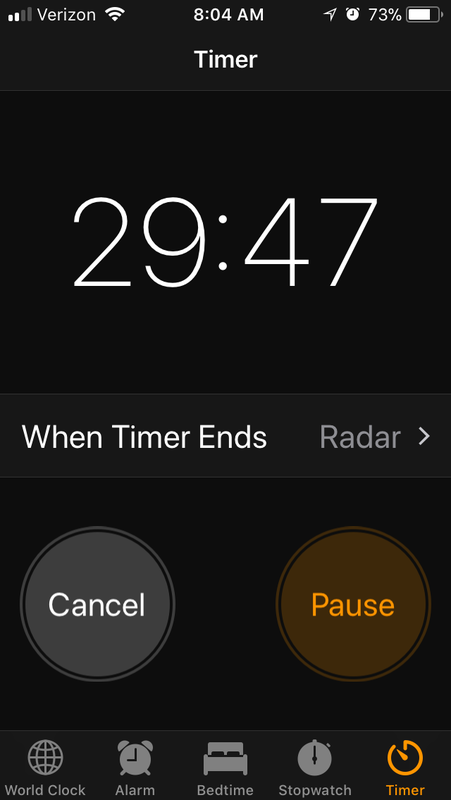 Click the "Paste/Type text" link near the top. 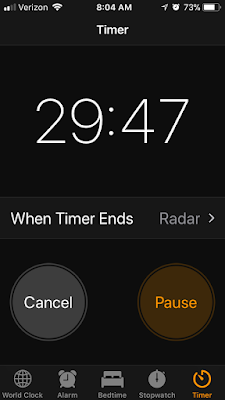 Copy and paste your list of names and click the "Apply" button. When your word cloud is created, use the different buttons to change the shape, colors, spacing, and font. When you're happy with your results, click the "File" button and choose how you'd like to save your family tree word cloud. Then share yours on Facebook and Twitter with the hashtag #familytreenames.